The Accsense A1-01a wireless environmental data logger is designed for general environmental measurements. It provides several different internal sensors, as well as a screw terminal connector for connecting to a wide range of external analog sensors. The pod also includes a +5Vdc output to power external sensors. In the event no gateway can be reached, individual pods will store data until a connection is restored. The stored data will be transferred to the online account. Pods have a range of approx. 80m (250ft), and can also act as a repeater for other’s signals. 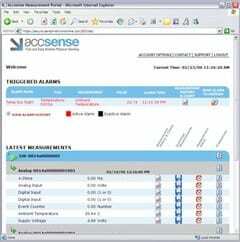 All of the measurements acquired using the Accsense Solution are immediately available on your secure Accsense Account, online. Each pod requires an online account subscription. Updated in real-time, you can plot measurement history, analyze tabular data, and set alarms to watch your data and provide email, pager, or cell phone alerts. Alarms are also sent for power or internet outage.